We work directly with local communities to ensure whales, dolphins and porpoises are protected and valued throughout Scotland’s west coast. Explore our interactive map to find out where the latest sightings are. Find out about our dedicated research vessel and how to get on board! Learn about our fascinating species of whale, dolphin and porpoise. The Hebridean Whale Trail is a network of fantastic whale-watching and whale heritage sites across the west coast of Scotland that will showcase the amazing wildlife, landscapes and heritage that make this area so special. Our seas are under huge pressure; increasingly busy, noisy and polluted. Scotland’s whales and dolphins exist in a fragile state, threatened by a range of environmental, climatic and man-made stresses. 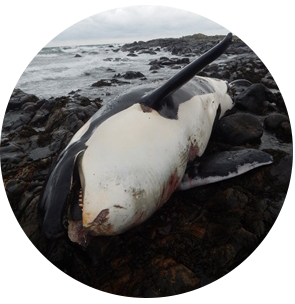 We are change agents; conducting the research that underpins the future safeguarding of whales, dolphins and porpoises. Training up volunteers to become citizen scientists on our research boat trips as well through our sighting networks. We also provide educational experiences in our dedicated Discovery Centre, on our boat Silurian and by visiting schools around the whole of the Hebrides. Join us on board to monitor marine life as we sail the Hebridean seas.